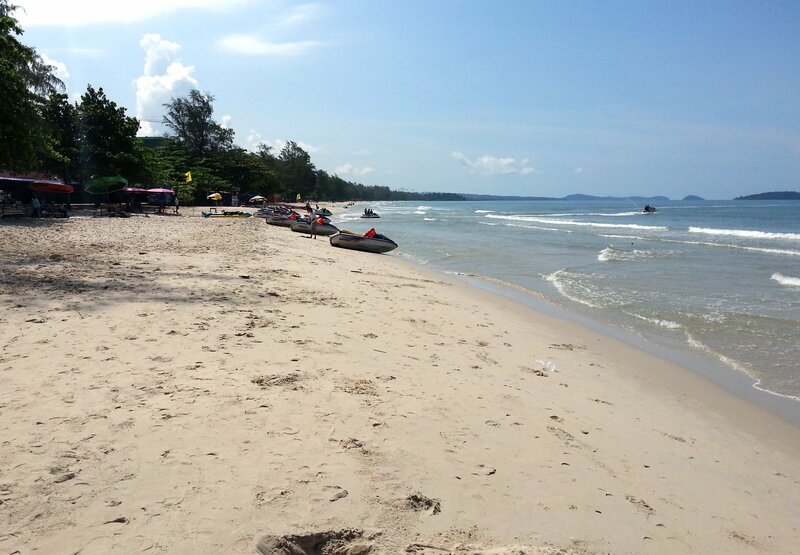 Ochheuteal Beach is a 3.5 km beach located to the south of Sihanoukville Town in Cambodia. The beach runs east until reaching a river mouth and headland which separates it from Otres beach which starts after the headland. 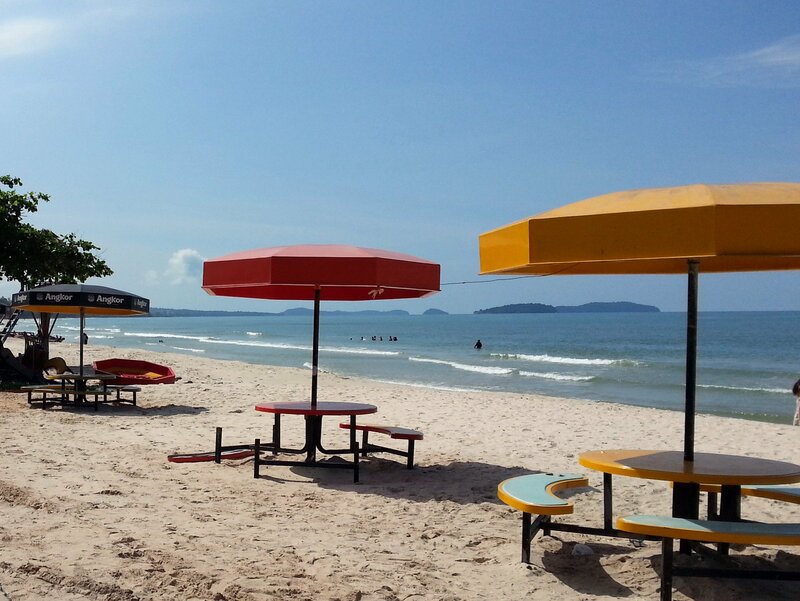 Partly because its a public beach and partly because of its location near Sihanoukville Town, Ochheuteal Beach is the busiest and most developed beach in the area. Ochheuteal Beach is a thin strip of wide sand backed by continuous line of bars, resort and restaurants running along the first 1,300 metres of the beach front heading west to east. The eastern end of Ochheuteal Beach, known locally as Serenpity Beach, is the busiest part Ochheuteal Beach. 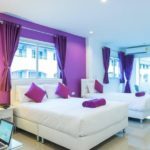 The headland to the west of the ferry pier and the approach road to the beach (Serendipity Beach Road) has lots of inexpensive guesthouses, bungalows and places to eat at a reasonable price. 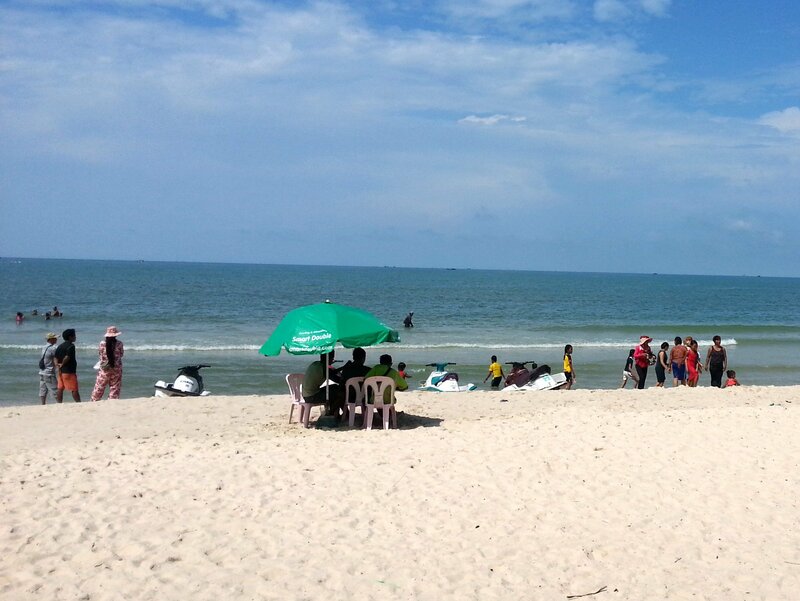 This part of Ochheuteal Beach is popular with Cambodian tourists as well as the ever increasing number of Chinese tourists who mostly stay at the hotels, many of which have casinos, in the town centre. Cambodian tourists tend to visit in large family groups and pitch up on the beach for the whole day with crates of beer and food which creates a jovial atmosphere. You don’t need to bring your own beer and food with you to Ochheuteal Beach as there are lots and lots of different kinds of outlets along the beach where you can buy food and drink. 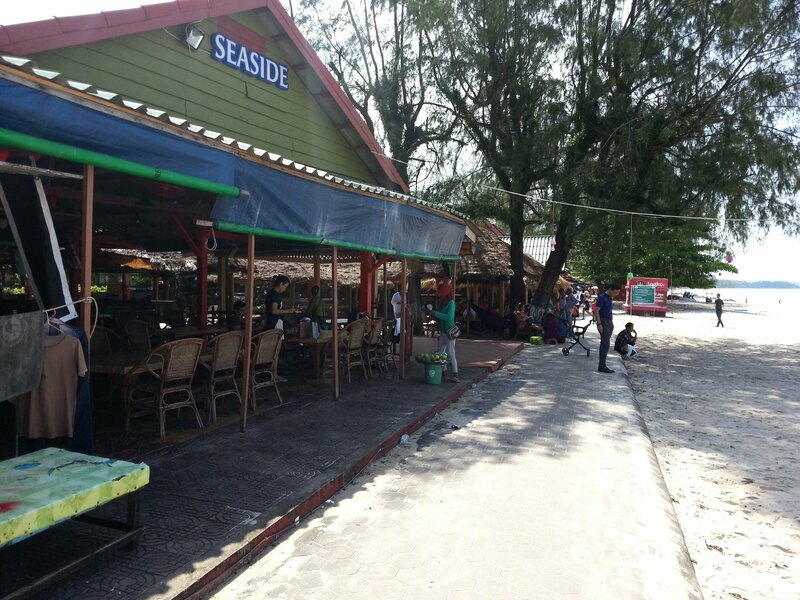 There are large formal restaurant as well as smaller beach cabin style kiosks selling drinks and snacks. 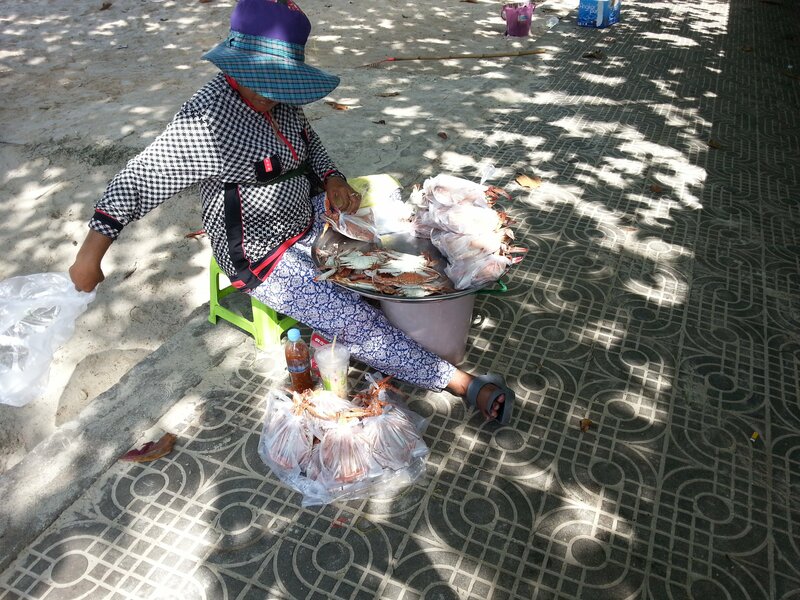 Ochheuteal Beach is also well known for having lots of beach vendors selling seafood, fruit, meat on sticks and pretty much every kind of snack its possible to sell from a basket that you can carry in the hot sun. The number of vendors, restaurants and Asian tourists really thins out beyond this 1.3 km strip. Ochheateal Beach becomes a much more pleasant place thereafter with just a few hotels, bars and restaurants and fewer people. At night, however, this part of the beach is very quiet whilst Serendipity Beach becomes very lively with people drinking a lot late into the night. If you decide that Ochheuteal Beach is a bit too built up and tourist oriented for your liking then we suggest that you move to Koh Rong for the remainder of your stay in Sihanoukville. 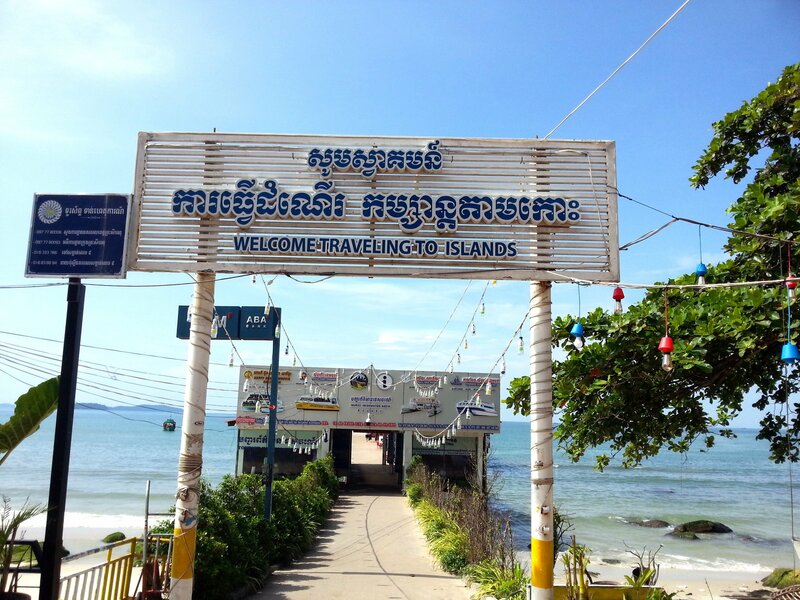 Koh Rong is an island 45 minutes by speedboat off the coast with less developed beaches and a more relaxed atmosphere. Ferries to Koh Rong depart from a pier which is located at the eastern end of Ochheuteal Beach at the bottom of the Serendipity Beach Road (Street 502). 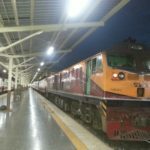 Ochheuteal Beach is located 9.1 km by road from Sihanoukville Railway Station.